Genetically Modified Organisms….Friend or Foe? When someone mentions the phrase, “Genetically Modified Organisms (GMO)”, what comes to mind? Do you see it as life saver or just as a dangerous experiment? Or do you have absolutely no idea what a GMO is? Just so we are all on the same page a GMO is defined as “genetically modified organism: an organism or microorganism whosegenetic material has been altered by means of genetic engineering” (Dictionary.com). GMOs have been researched for three decades now. GMOs beginning step towards be patented was in 1980. This case was situated in the U.S Supreme Court, called Diamond v. Chakraberty, which proved that a GMO can be patented. That patent was issued to Exxon Oil company, which was a GMO that was an oil-eating microorganism. In 1992, the FDA approved the first GMO to hit the market! The first few genetically altered products to hit the market were: the ‘Flavr Savr’, cotton plants with built-in resistance to insects, and crops that are resistant to ‘Roundup’. ‘Flavr Savr’ tomato hit store shelves in 1994. This genetically altered item was a “delayed-ripening tomato”, which allowed it to remain ripened for a longer period of time compared to organic/conventional tomatoes. Across the Globe, in Europe, the EU’s first genetically modified product was approved in 1994. That product was tobacco. In 1996, GMOs enter a new branch of the world market, agriculture. The first product was ‘Roundup Ready Soybeans,’ which were soybeans that were resistant to glyphosate herbicide. In 1997, the European Unions voted in favor of mandatory labeling on all GMO food products. The problem that some see with Genetically modified foods is that there is not enough research to prove that they are truly safe. But that point has been debated many times, saying that there has been three decades of research that proves their safeness. Some people believe that GMO’s will harm their offspring with physical disabilities. The thing is that average everyday citizens will not be able to find out if they are experiencing health risks from GMO’s on their own due to the fact that the FDA does not require companies to label their food products. That means companies do not have to specify whether or not they have GMOs in their product. That right there is a huge problem with Americans. Americans believe in the right of knowing what they are putting into their bodies. That should be a right for all citizens. In poll taken by the National Research Center, 92% of all adults stated that they believe that companies should legally have to label their foods. 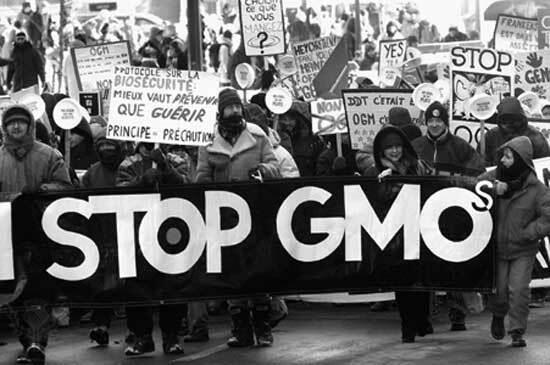 There are many groups out there in the world that highly against GMOs, such as the Earth Liberation Front and the Union of Concerned Scientists. The Earth Liberation Front is a radical group that burnt down GMO offices at Michigan State! The agreement for the use of GMO is more prominent considering the fact that more and more GMOs are being released into the market. The great thing about GM food plants is that they can grow larger and stay ripened for longer periods of time and are even resistant to pesticide. Many farmers in Africa/Asia are poor farmers, who barely ave enough food to support their family. Their soil is poor, which means the soil cannot provide plants with enough nutrients. But with these plants being Genetically modified poor farmers can harvest more and larger plants, thus giving more food for his or her family. 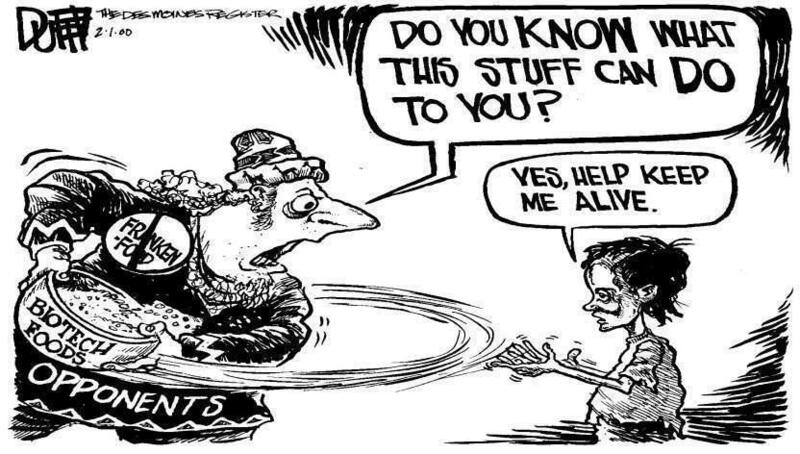 This cartoon depicts a man taking away BioTech foods away from a malnourished person. The person on the right realizes that the BioTech helps keep him or her alive. In my opinion, I see GMOs as a great thing and a bad thing. It is wonderful how with genetically modified plants we can create larger and more productive plant. But then again, we do not know for sure the effects of GMOs. I do believe that Americans have the right to know if GMOs are in their food products or not, that should be a basic right. By not saying the ingredients makes it seem like companies are hiding something. One again, I see the great parts to GMOs and the harmful parts. But now it is up to you to decide how you feel about GMOs. Do more research! This is an interesting topic that you can never get bored with. Try out this Pole before you exit out of this blog post!